Magic Millions horses on the beach at Surfers Paradise for the barrier draw and Commonwealth Games baton relay arrival. 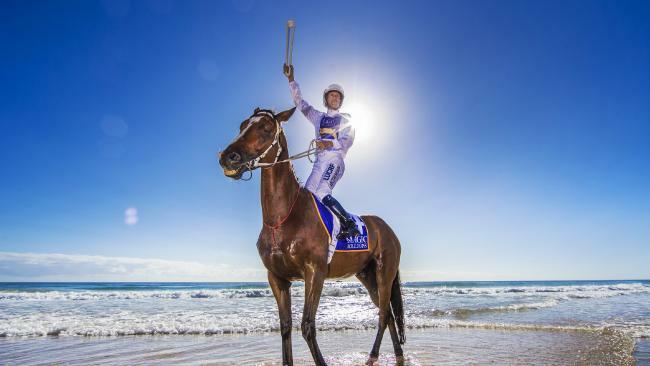 Champion jockey Hugh Bowman, carrying the Queen’s Baton. Picture: Nigel Hallett. Magic Millions 3YO Guineas favourite Pierata has been passed fit as expected following a veterinary check on Friday morning. All-in punters were given a slight scare on Thursday after vets were not totally satisfied with Pierata after routine inspections on Thursday, however Chief steward Allan Reardon stressed there were no real issues with the Pierro colt. Pierata is the $2.40 favourite following a big win in the Group Three Vo Rogue Plate at Doomben on December 30. The news was not good for connections of Arrestar however with the Matthew Dunn-trained gelding scratched following a vet inspection. Arrestar was found to be lame in the near hind. The scratching of the Star Witness gelding has opened up a spot for first emergency I Am Impinge, with jockey Jeff Lloyd, who had been booked for Arrestar, now taking the ride on the Toby Edmonds-trained gelding. Meanwhile Lady Of Crebilly will undergo another inspection before she is allowed to run in the Guineas. Reardon said an abscess had come through on the filly's hind leg. The vets will also assess Classic hopefuls Quackerjack and Paquiri later on Friday but there are no major concerns with them at this stage. Victorian filly Anthemoessa arrived in Queensland on Friday morning and also passed an inspection. Another Victorian horse Nikitas missed the plane to Brisbane and was scratched from the Cup.